We Go to a Dedication | Sprezzatura, Y'all! 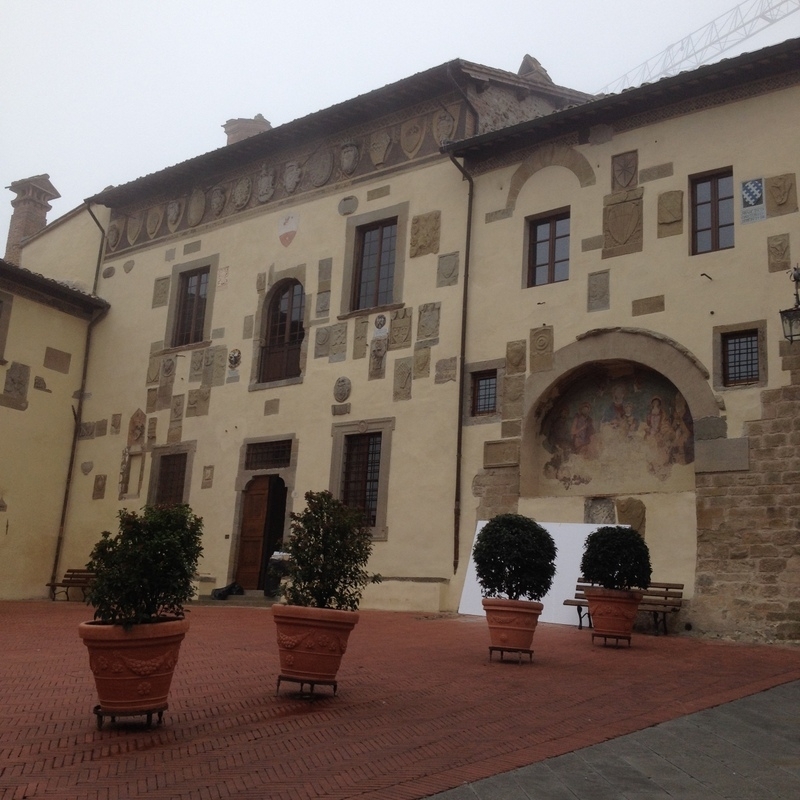 I’ve said this before and I’ll probably say it more times, but Anghiari is really a small town. One of our neighbors, an older gentlemen who speaks absolutely no English, lets us know about all the insider events going on around town. He recently told us about something on venerdi sera (Friday evening) in Piazza Popolo. He said a lot more than that, but that’s all we understood. We later saw a poster somewhere that also gave us a time – 9:00 pm. So we went. It was the dedication of the renovated city hall. It had taken years to renovate because it takes years to renovate things in Italy. These buildings are hundreds and hundreds of years old and if you’ve ever done any renovation work on your home, you know that it always takes longer because once “they get in there” there’s no telling what they’ll uncover. 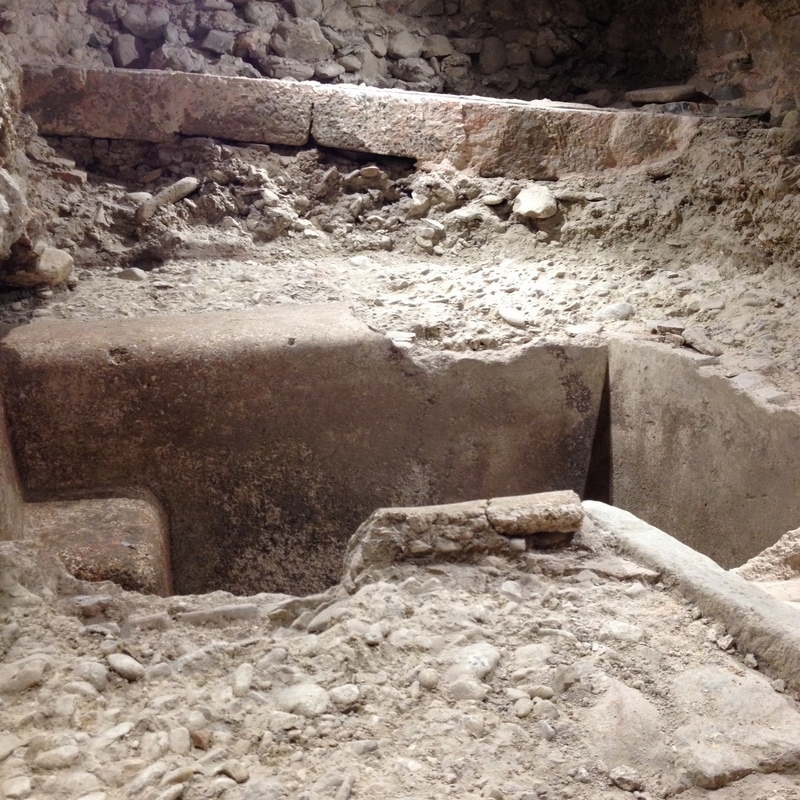 Well, what they uncovered here was an ancient Roman wine making facility. These discoveries date from the first century BC. I guess I can see how redoing a floor and uncovering this would complicate the renovation. But they incorporated it into the building and now you can see it, and even go down into it. It’s really cool. But back to the dedication. This was a big deal. The town band was there – the barber plays the tuba – and our older neighbor who invited us told us he laid the brick pavers in the piazza out front. There was musical entertainment, speeches (short), a blessing by the priest (complete with incense), and tour guides dressed in Renaissance garb. And afterward in the garden below, refreshments – roasted chestnuts and wine. This building is beautiful. It’s been used as a seat of government since 1386. The ground floor was used for the courts and prisons. The administrative offices and library are above. 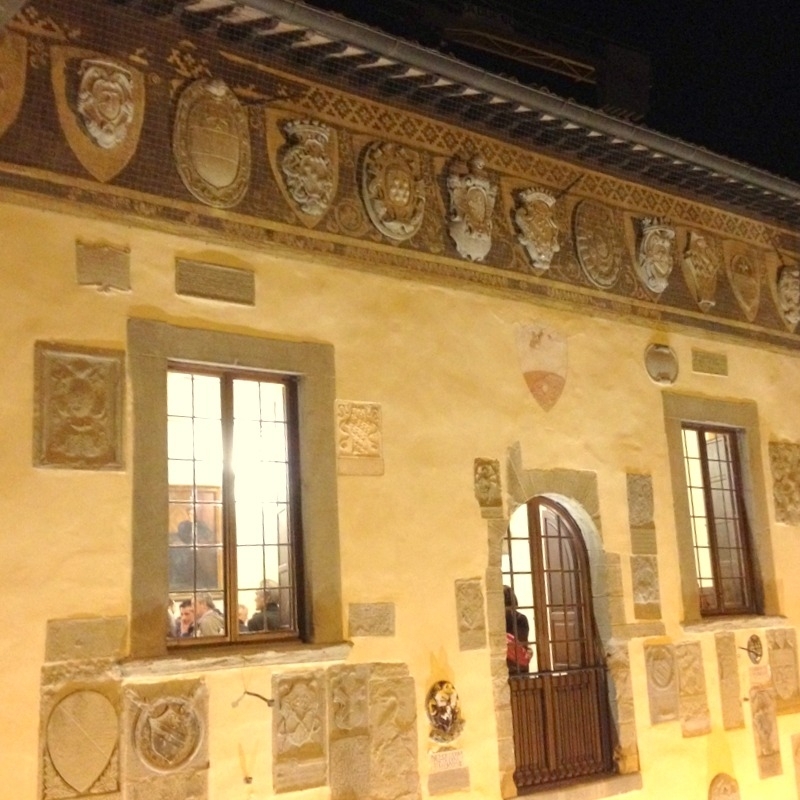 The outside of this building is a mosaic of stone coats of arms and other plaques and commemorations adorning it. Attending this was a great experience. We saw our new friends celebrating the completion of an important civic project and they were all obviously proud. It was part Mayberry and part Europe. Can you imagine going to the dedication of the renovated city hall at 9:00 pm? Can you imagine having a priest bless the whole thing? Can you imagine most of the town turning out? It made us feel so much a part of this place – we saw familiar faces and got a personal tour of the place from our other neighbor (who also speaks no English), who took so much delight in showing us this wonderful part of his town. Wish we could have been there for that! What a treat! These are things you’ll never forget. You never know what may be happening while y’all are here! Maybe you’ll get to go to something like that too. There’s always something going on. See y’all Wednesday!! Always a pleasure to read about all the unique things ya’ll are getting to do! Thanks Karen. It’s so much fun – today we had lunch with some friends from Atlanta who are house-sitting here for a month. It’s such a small world!